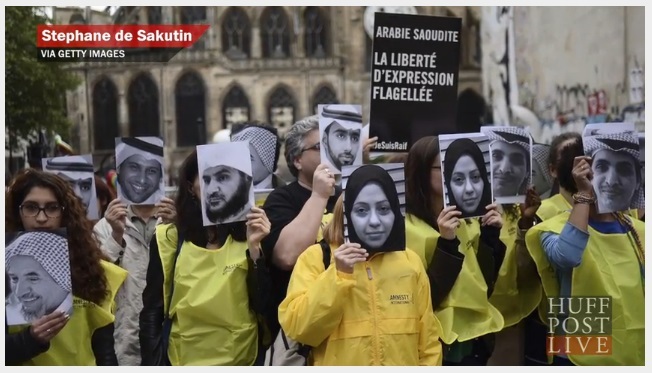 MSNBC: “Outcry over Saudi blogger’s flogging,” 1/22/15. Refugees: 6.15.2015: Al Hurra live interview, AI refugee report. Refugees: 6.15.2015: Huffington Post Live, “World Refugee Crisis Worst Since WWII” re AI refugee report. Saudi Arabia – Blogger Raif Badawi: Huffington Post Live, 06/08/15, Minute 12:00. Libya Refugees + Migrants: 05.11.2015: NPR / WBUR’s “Here and Now” — E.U. Pushes For Military Crackdown On Migrant Traffickers. Israel / Gaza: 7.16.2014: Interview: Israel calls for short break in fighting, CCTV (global Chinese network). Egypt: 6.24.2014: Al Jazeera Arabic — Sentencing of Al Jazeera Journalists, Global Response. Egypt: 6.23.2014: Wall Street Journal Live — Egypt Convicts Three Al Jazeera Journalists. Iraq: 6.16.2014: Al Jazeera English — Iraq’s new human rights crisis. ISIS takeover of Mosul. Egypt: 6.10.2014: Al Jazeera Arabic — Egypt and human rights after the election of Abdel Fattah al-Sisi. Syria: 6.10.2014: Huffington Post Live panel — The Pope’s Call for Action on Refugees and Migrants. Syria: 6.10.2014, Huffpost Live — The Church’s Role In Immigration & Refugee Crises, Video segment, spoke about Pope Francis’ recent call for action on refugees, migrants, and asylum-seekers attempting to enter Europe. Egypt: 6.10.2014 Al Jazeera — Human rights after the election of Abdel Fattah al-Sisi.video interview. Iran: 6.4.2014, Huffpost Live — Even Under Rouhani, Iran’s Schools Have Little (If Any) Freedom, Video segment, spoke about students and academics in Iran. Syria: 5.13.2014: Al Jazeera English — “Inside Story with Ray Suarez,” Syria crisis. Saudi Arabia: 4.17.2014, Voice of Russia America Radio — Saudi Arabia’s “Utterly Atrocious” Human Rights Record Getting Ever Darker, Radio interview, spoke about human rights in Saudi Arabia. Syria: 3/31/2014: Al Jazeera Arabic — Syrian government’s use of cluster bombs and a new report (PDF) by the Syrian Center for Human Rights. Egypt: 10.3.2012, WBAI — Egyptian Military and Police Abuses, radio interview, talks about human rights violations by Egyptian army and police. Sky News: Imprisoned Bahraini hunger striker AlKhawaja, 5/1/12. Syria: “Syria’s humanitarian crisis: three ways Trump could help,” The Guardian, 04/07/2017. Qatar: 06/09/15: “Qatar leans on K Street connections,” Megan R. Wilson, The Hill. Qatar: 5.30.2014, MSNBC — Why the World Cup is no game, featured online, quoted on labor rights regarding World Cup in Qatar. Palestine: 04/02/2014, Al Jazeera — “Have Palestinian leaders failed their people?” (quoted in AJ interview with Dr. Saeb Erekat @ 26:50). Saudi Arabia: 3.31.2014, Washington Examiner — Obama refuses to raise human rights issues with Saudis, featured online, quoted on Saudi Arabia women’s activists. Saudi Arabia: 3.29.2014, Bloomberg — Obama Seeks to Reassure Saudi King on Iran Talks, Syria, featured online, quoted on human rights. Saudi Arabia: 3.29.2014, McClatchy DC — Obama honors Saudi woman’s fight against abuse, heads back to Washington, featured online, quoted on Obama’s lack of attention to human rights in Saudi Arabia. Saudi Arabia: 3.27.2014, ABC News Radio — Amnesty Int’l Challenges Obama to Bring Female Driver to Saudi Arabia, featured on radio, quoted on Obama position on female drivers in Saudi. Saudi Arabia: 3.26.2014, Al-Monitor — Members press Obama to raise human rights in Saudi Arabia, featured online, quoted on Congress pressing for human rights. Egypt: 3.13.2014, International Business Times — With Hundreds of Egyptians Sentenced To Death, Security Forces Can’t Keep Up, featured online, quoted on Egyptian government. Israel/Occupied Palestinian Territories: 9.23.2013, Associated Press — Israel PM: Settlers to return to contested home, featured online, quoted on US silence regarding settlements. Bahrain: 12.10.2013, Buzzfeed — Bahrain Holds Forum Lauding Social Media While Violently Suppressing Twitter And Facebook Critics, published online, quoted on social media censorship and punishment in Bahrain. Bahrain: 8.14.2013, Al Jazeera America — Bahrain protesters face security clampdown, published online, quoted on human rights in Bahrain. Bahrain: 2.14.2013, Business Wire — Participant Media’s Social Action Campaign for Oscar(R)-Nominated Chilean Film No, Focuses on the Importance of Freedom of Expression, published online, quoted on campaign and human rights in Bahrain. Bahrain: 1.15.2013, ProPublica — Revealed: America’s Arms Sales To Bahrain Amid Bloody Crackdown, published online, quoted on arms sales to Bahrain. Syria: 12.10.2012, The Atlantic — Are Women Being Targeted in Syria? Featured online, quoted on Syria war, women’s safety. Libya: 9.24.2012, MintPressNews — Amnesty Briefing Suggests Foreign Nationals Worse Off Post-Gadhafi, published online, quoted on human rights in Libya. Pan-Islam: 9.24.2012, Washington Times — Muslim-led nations seek global ban on insults of Muhammad, featured online, quoted on anti-Islam propaganda. Syria: 9.10.2012, Foreign Policy — Syrian cyberwar rages on, featured online, mentioned regarding pro-Syria Amnesty website hack. Israel/Occupied Palestinian Territories: 9.4.12, CNN — Israeli court: American protester Rachel Corrie’s death an accident, featured online, quoted on Rachel Corrie. Syria: 8.28.2012, Washington Post, Amnesty International Web site hit by pro-Syria hackers, featured online, quoted on Syria war. Syria: 6.7.2012, McClatchy DC — Commentary: Latin America’s response to Syria massacre was too weak, featured online, quoted on Latin America’s geopolitical muscle, Syria relations. Syria: 5.29.2012, The Washington Times — Diplomats from Syria expelled by U.S., allies, featured in print, online, quoted on Russia’s stance on Syria. Drones: 5.1.2012, American Independent — U.S. companies selling drones to undisclosed foreign governments, featured online, mentioned on arms sales overseas/lack of transparency. Bahrain: 5.1.2012, Sky News UK — Sky News (UK) interview with Sunjeev Bery, Amnesty International USA, TV interview, quoted on Bahraini hunger striker. Syria: 02.2.2012, UPI — Amnesty blasts Russia’s stance on Syria, featured online, statement quoted on Russia’s stance on Syria. Bahrain: 10.19.2011, CBSNews — Report: U.S., Euro arms used against Arab Spring, published online, quoted on arms sales to Bahrain. Bahrain: 10.19.2011, Los Angeles Times — U.S. delays arms sale to Bahrain amid ‘Arab Spring’ crackdown, featured online, quoted on Bahrain protest. Morocco: 11.22.2013, Huffington Post — What Will President Obama Whisper in This King’s Ear? Published online, coauthor. Israel/Occupied Palestinian Territories: 9.14.2013, The Hill — What if your home was turned into a military firing zone? Published online and then later in Huffington Post, co-authored by Sunjeev Bery. Israel/Occupied Palestinian Territories: 3.22.2013, Huffington Post — One Palestinian Village Obama Should Visit, published online, author. Bahrain: 12.06.2012, Huffington Post —This Weekend in Bahrain: Will US Officials Stand Up for Freedom? Op-ed authored by director. Syria: 3.22.2012, The Register Citizen — Syria’s systematic torture, published online, author. I wrote or cowrote the following articles prior to joining the staff of Amnesty International. They reflect my own opinions and analysis at that time. They are not intended to represent the positions or views of Amnesty International. Egypt: 04/2011 Roots of Discontent: Egypt’s Call for Freedom, Harvard Kennedy School Review. Egypt: 02/04/2011 Comment on “Egypt’s Agonies” editorial, The New York Times. Egypt: 01/29/2011 Comment on “Washington and Mr. Mubarak” editorial, The New York Times. Pakistan: 10/26/2010 Pakistan Foreign Minister Mixes Criticism and Praise of US Foreign Policy, The Citizen (Harvard Kennedy School). Israel / Occupied Palestinian Territories: 10/04/10 Turkish Foreign Minister Slams Israeli Settlements in Harvard Speech, The Huffington Post. Israel / Occupied Palestinian Territories: 06/01/10 Washington Post Journalists Repeat Israeli Claims as Fact, The Huffington Post. Israel / Occupied Palestinian Territories: 05/17/10 Boxer vs. Feinstein: The Path to Middle East Peace, The Huffington Post. Drug War: 02/03/10 Dollar vs. Dollar: U.S. Consumers Battle U.S. Taxpayers in Global Drug War, The Huffington Post. Drones: 10/26/2010 US Newspapers Ignore Drone Missile Critics, The Citizen (Harvard Kennedy School). Israel / Occupied Palestinian Territories: 10/13/2010 Israeli Policies Face Jewish Critics, The Citizen (Harvard Kennedy School). Drones: 11/05/09 “Pretend Secrecy” Shields the White House from a Drone Missile Debate, The Huffington Post. India: 09/11/09 Financial Times Withdraws Award To Narendra Modi, Gujarat’s Chief Minister, The Huffington Post. Afghanistan: 08/30/09 Comment on America’s Moral Responsibility in Afghanistan, ForeignPolicy.com. Pakistan: 08/19/09 Lack of Coverage on Transgendered Pakistanis Shows Bias in U.S. Media, The Huffington Post. Iran: 06/23/09 CNN Praises a Dictator, The Huffington Post. Iran: 06/22/09 CNN’s Navarrette Gets Iran Wrong, The Huffington Post. Israel / Occupied Palestinian Territories: 06/18/09 Israel’s Ban on Crayons, The Huffington Post. Israel / Occupied Palestinian Territories: 06/06/09 Israeli Media Reads the Fine Print, The Huffington Post. Pakistan: 05/18/09 Pakistanis Debate Their Future On Facebook, The Huffington Post. Middle East: 05/05/09 Why Deepak Chopra is wrong (with Sahar Shafqat), The Huffington Post. Pakistan: 03/15/09 Web letters: Pakistan in Turmoil, The Nation magazine. Israel: 04/15/2008 Tel Aviv Tango, Tehelka Magazine (India). U.S.: 10/13/2004 It’s time to ask Ashcroft questions about civil rights, Mercury News (San Jose).